"I’ve never been someone who has been jealous of others or felt completely insecure in themselves. I’ve never felt so self-conscious about what’s on the inside of me. I’ve always hated my body, my tummy, my skin but never my personality. I actually pride myself on being a sweet, thoughtful and loving individual. These last few months have been so hard. I’ve been called a liar, I’ve been talked about behind my back and I’ve been told I shouldn’t feel things that I do. Well enough is enough. Crying tears over and over again over these feelings is painful. It’s a judgement that disgusts me and upsets me more than words can say. Have you ever felt so hurt you could barely talk? That’s where I am right now and I can’t do this anymore." Life is hard sometimes and let's be honest, everyone goes through ups and downs. Not everyone is public with them and social media is disappointingly, often a place where we as human beings share a picture perfect version of their lives. Whether it's happy memories or the "Insta-shot", it can make people feel sad about their own lives. I've never been one to shy away from the truth and I've always been as open and honest as I've felt comfortable with. The start of this year was hard for me. I had so many great and happy moments and I made so many friends but the start of relationships can be difficult and I do feel like I had quite traumatic parts too. I'm writing this not to share my internal emotions although I have done, but to make a point to say it's okay to not be okay. I read this a while ago and fell in love: "saying someone can’t be sad because someone else may have it worse is like saying someone can’t be happy because someone else may have it better." It's so true! 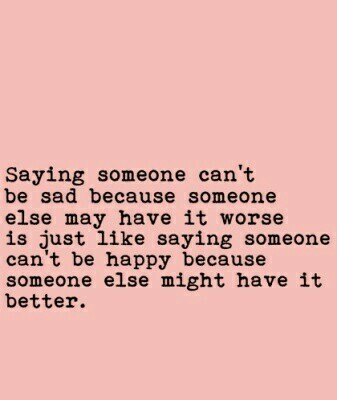 Don't feel bad for being happy OR sad. You have every right to feel every emotion in the world. Be you, be you, be YOU!